Who He Is: One of the most highly-respected cartoonists in North America and a well-regarded illustrator and designer. Why He's Important: Former Los Angeles-area animator Jim Woodring is best known for his surreal, lushly-painted stories starring a character named "Frank." In Seattle art circles, his work is treated with silent awe -- his are always the first pieces to go at comics art auctions, and offers for work from fellow designers never stop. A successful freelance designer, web artist and painter, it's been written that his body of comics work is one of three or four most likely to be remembered 500 years from now. TOM SPURGEON: You've described your work in animation in less-than-flattering terms. Is there anything at all that you took away from your experience there you apply to your comics? JIM WOODRING: Yes indeed. Doing storyboards taught me a lot about storytelling and forced me to learn to produce on demand. There were some first-rate practitioners working at that studio and they taught me a lot. I also learned that I work best by myself. SPURGEON: I know a lot of the younger cartoonists enjoy having contact with cartoonists like you and Peter Bagge. Do you think you have a specific role in a Seattle comics community? 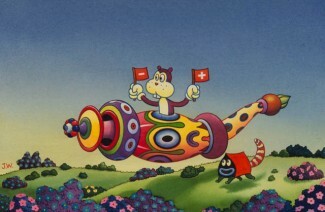 WOODRING: I like to think of myself as an opinionated, insecure Dutch Uncle who can't wait to lecture someone. I love to talk shop. And it's important for younger cartoonists to see what this kind of "career" can do to you; with my ruined physique and totally dessicated social skills I'm a valuable object-lesson. SPURGEON: You once described your Ravenna neighborhood as the best in Seattle -- what makes it so? WOODRING: It's the best neighborhood for walking, that's for sure. The houses are loaded with personality and there's an incredible range of plant life. It has thick, sticky moods and millions of tiny vistas. SPURGEON: In terms of alternative comics, your work is terribly idiosyncratic. Can you describe briefly a few of your important influences in and out of that medium? WOODRING: Boris Artzybasheff, R. Crumb, Harry McNaught, T.S. Sullivant, Dali, Satie, Herriman, Henry Miller... that bunch. SPURGEON: I've seen some of your illustration and design work, and you've also worked for Microsoft. Has Seattle been a good place to explore those kinds of opportunities? WOODRING: Sure! This town is just bubbling over with fascinating business. But it's becoming like Los Angeles in that straightforward, humane deals are getting harder to come by. It's painful to watch sweet old Seattle become just another playground for vulgar sharpies. SPURGEON: As a lot of your work is based on very personal symbolism, what do you think people get out of reading it? WOODRING: I don't know, but I hope it's something akin to what I get out of putting the work together, which is a feeling of love for a world that offers such rich opportunities. NOTE: This was originally done for something called The Stranger Guide to Seattle. I don't know if it made it in, but if it did, I was informed it doesn't have my name on it.